Unable to resist the homage to its big brother’s iconic opening, this series kicks off with 19-year-old junkie, Nick Clark awakening from a stupor inside the dwellings of an old, abandoned church-turned-drug-den. Groggily ambling about in search of his friend, Gloria, Nick calls out to her; she does not respond. Making his way downstairs to the sanctuary, he immediately realizes there’s something wrong. Distant screams echo through the corridors and masses of blood soak the stairway railings. Fear seizes the youth as he comes across more and more mutilated bodies splayed throughout the downstairs before finally finding Gloria. Unfortunately, she’s enjoying a fleshy human snack behind one of the church pews. Donning the iconic Walker Eyes, the girl rises to greet Nick in the most horrifying way. He races from the scene. We’re offered a glimpse of downtown Los Angeles as Nick hysterically runs out into traffic, where he’s hit by a car. Following this white-knuckle opener, things come to a crashing halt as we’re introduced to the other main characters across town. Nick’s dysfunctional family greets the morning with plenty of melodrama to go around. Smarty-arty sister, Alicia, exhibits a perpetual scowl as her high school guidance counselor of a mother (Kim Dickens) flirtatiously canoodles with live-in boyfriend Travis (Cliff Curtis), before the family gets the news of Nick’s accident. Believing to be out of his mind, Nick refuses to cooperate with the police as they interrogate him from his hospital bed about his earlier ravings—blood, viscera, death. Given Nick’s long history of substance abuse, everyone assumes the young man hallucinated the whole thing, including his family as they arrive at the hospital. Later at school, more evidence of the impending apocalypse comes forth as Nick and Alicia’s mom, Maddie, makes mention to the low number of children attending. Apparently, a mysterious “flu” runs rampant throughout the U.S., but everyone seems to turn a blind eye to the potential threat. Maddie confiscates a knife from a paranoid teen, demanding to know why he felt the need to bring it. Instead of taking solace in the counselor with who he seems to have a good rapport, the teen simply makes an ominous mention of everyone’s imminent doom, leaving the conversation completely void of any useful details. Gee, thanks a pant-load, kid. Travis decides to check out the ramshackle church Nick ran from earlier, seeing the same blood and viscera—minus the bodies. Instead of calling the police (like a smart person might), Travis tells Maddie about his discovery. In all absurdity, Maddie brushes off the murderous rampage as nothing more than typical druggie behavior. When Nick’s roommate at the hospital dies, he uses the distraction to escape, forcing Travis and Maddie to go out and find him. Chaos around the city continues to rise as more and more people go missing, including Alicia’s boyfriend. A police shootout is captured on film of 5-O trying to take down a Walker, which gets leaked over the internet. Again, everyone assumes the video is just a hoax. Meanwhile, Nick meets up with an old friend, Calvin, at a local coffee shop. This supposed clean-and-sober pal has actually been selling Nick and others drugs for quite some time. Nick begs for dope so that he can forget about what happened at the church. Afraid that Nick ratted to the police about him, Calvin promises to supply Nick with the drugs and drives him out to the L.A. River with the intent to kill him. The plan backfires though when Nick becomes wise to the plan. The two struggle to gain possession of Calvin’s gun before Nick shoots in self-defense. Maddie and Travis meet up with Nick, coming across Calvin’s re-animated corpse. When Maddie and Travis refuse to believe that he’s actually a “zombie,” but merely hurt, they confront Calvin. The Walker attacks the pair before Nick repeatedly plows over Calvin with Travis’s truck. 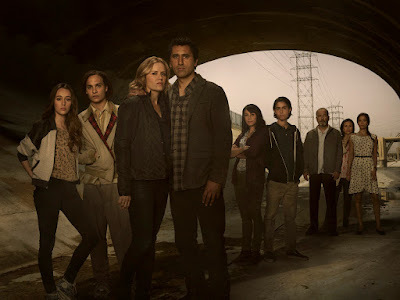 When weighing this spin-off series to the visceral nature of its predecessor, the pilot episode of “Fear the Walking Dead” is undoubtedly underwhelming. Does that make it bad? Not exactly. It’s simply rocking a different tempo, more akin to True Detective’s slow-burn approach. The downside to this style change might deter some TWD fans who are looking for a more exhilarating ride from start to finish. Let’s face it, the series premiere to The Walking Dead was far more memorable and compelling. And with viewers’ knowledge of what this future world of Walkers will look like and the rules necessary to survive in it, Fear runs the potentially fatal risk of being repetitive. Plus, the “everyman” status of all the main players who are clearly not connected to the initial cause of the Walkers will make it harder for fans to get the true origin story. Plenty of television series and films gloss over the beginning stages of contagion for a reason. Audiences generally hunger for nail biting intensity woven into the infection plot, and it’s hard to balance that entertainingly with the contemporary setting and characters still living seemingly normal, mundane lives. One show that nailed this patient zero-outbreak plot with brilliant execution would be FX’s The Strain. Mixing the stories of everyday civilians with the group of doctors who are up close and personal to the vampiric infection running rampant, the series shows the slow unraveling of society along with the brilliant mystery behind the epidemic with continuously solid, scary, well-paced episodes. Though it’s too early to judge Fear the Walking Dead on its overall value, the pilot clearly lacks this desired effect. Plus, several red flags already wave even with just one episode viewed. If Walkers are already out and about, then why hasn’t anyone really seen them with the exception of one video? Did they all just run or . . . walk into hiding? It’s pretty safe to say that the Walkers don’t really care about displaying showmanship to scare folks at the opportune moment, so the fact that the general population hasn’t seen any of them in this age of technology is clearly just convenience for the writers. Plus, everyone seems abundantly dimwitted as to what’s happening around them with the exception of Nick—the drug addict! In times of survival, if the junkie seems like the most capable of the bunch, it’s about time you find yourself a new group to roll with.